In two years of Asian travel my diabolos had spent almost all of there time disassembled at the bottom of my bag, so it was a relief when I recently visited Kuala Lumpur and was lucky enough to meet up with lots of Malaysian Diabolists. In two days I got to meet 3 different ‘diabolo teams’, join an practice session with an incredibly high level of skill, see a classic public performance in a shopping mall, and visit the converted studio/office space of Ya Ping Diabolo Dance to practice my ‘body language’. The quantity and quality of Diabolists in this one city was phenomenal and many of the tricks left me speechless (it’s not every day that you see somebody pull of a 53sun on their first attempt at 4 low) but far more interesting than the cool tricks was the different culture of diabolo in Malaysia. Rather than a hobby and juggling prop they view Diabolo is part of their Chinese heritage, and that classic Asian style and the formation of Diabolo teams dedicated to performance come directly from that culture. Like many of you I’ve watched several videos of Asian Diabolo troupes from Malaysia and Taiwan with synchronised team displays but I’ve never really known much about the culture that surrounds those teams’ style and skill. A few of the diabolists I met are on diabolo.ca and most certainly know about, watch and absorb ‘western’ videos but there is definitely a divide between east and west and its interesting that a common prop can have such different cultures. Considering that there are probably as many or more diabolo players in Tiawan and Malaysia than the rest of the world combined it’s probably worth knowing a little about what goes on over there. What follows is a review of my visit and some of the things that I learnt about diabolo culture in Malaysia. I was met by Heng Ee and Luke, the joint leaders of Ya Ping Diabolo Dance, and driven across the KL to their Sunday morning practice area, a school courtyard. They are both students at University and have been playing diabolo for 10 years or more after starting at primary school and then later joining the Ya Ping team. Like them almost everyone else I met had been diaboloing for a long time, started young and were currently students at high school or college. Despite this I was told that diabolo has a brief history in Malaysia and was only brought here 15 years ago by the original sifu(master/teacher) ‘Ya Ping’ from Tiawan, after whom the diabolo troupe is named. Now, two of Ya Ping’s original students are the coach/managers of Ya Ping/TND, and Soul diabolo teams. Amongst Chinese students Diabolo is taught in schools as an extra curricular activity and as part of their Chinese heritage. All of the diabolists I met were of Chinese descent and spoke Mandarin as there first language, there were no players from the other main Malaysian ethnic groups, Malay and Indian, as they presumably have no cultural link to the diabolo and it is not taught or chosen at schools. 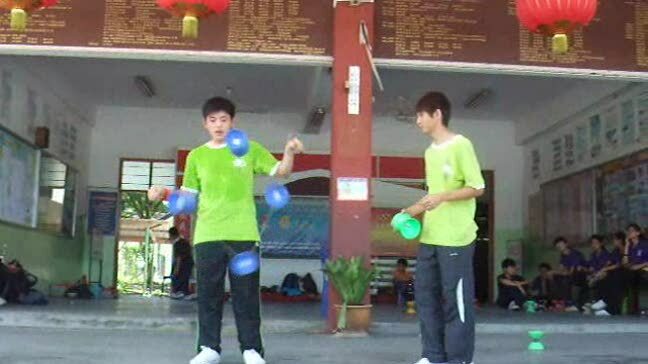 Ya Ping and the other teams continue the tradition by teaching diabolo in schools and when I first asked Luke how many diabolo school teams there were, as opposed to professional troupes, in KL he told me that there were hundreds, all with many pupils. When you consider the cultivation of this many players in one place along with a strong tradition of strict training and team performance its not surprising that there are a lot of good players in Malaysia. Periodically everyone downed sticks to watch Diabolotino, one of the stars of TND diabolo team and winner of the solo 2009 Superdiabolo cup in Tiawan. His big tricks with 1, 2, and 3 diabolos were super solid, stylised and performance smooth. In particular he was able to manipulate 3 low with effortless ease, stringing together big tricks in runs that would last minutes. I was more that a little surprised when his first run of 4 low included a clean 53sun and I had to ask him many times to repeat tricks so I could capture them on video. When there is somebody this good to watch it’s easy to forget the generally high skill level and that many others were pulling off very cool stuff. It’s not too difficult to see where this all comes from. I’m used to local juggling clubs in the UK where there might be one or two diabolists along with the odd convention where there will be a few more but all of these teams meet up every week to practice in a fun and formal environment where they share skills, teach tricks, learn routines and work towards competitions and performances. There was a real friendly team atmosphere and after a long practice they we all went out for lunch, which is something that they do every week (perhaps that’s like going to the pub after a juggling club). If that wasn’t enough, after lunch almost all of them went of to spend the afternoon at team basketball practice. That evening I was taken out of the city centre to a shopping mall where Soul D diabolo troupe were performing a public routine to celebrate Moon Cake festival (Soul D are a smaller performance group like Ya Ping with around 15 full members, where as TND is much bigger with more than 100). It was a classic public performance with lots of synchronised routines of fairly simple tricks, along with some more technical 3d feeds and some very cool 2 person stuff with 1 and 2 diabolos on a super long string, including a huge 2 person fan (something to try at my next convention). It was audience pleasing but from my short practice session with them before hand I knew that they were far more technically capable. Still it was interesting to see as this sort of performance is a really important aspect of the diabolo team culture in Malaysia. It’s not only what their training is geared towards but also seen as part of their cultural heritage and its important to them that they continue it. With all of the diabolo troupes I met there was a clear link with Tiawan and the similar diabolo community there with its shared Chinese culture and language, where many Malay teams had gone for competitions. It’s there where the diabolo troupes full technical skills are on display but still within a formal traditional routine. The next day I got to go along to Ya Ping’s ‘body language’ practice session. It took place in their rented studio/office space (strange that I never associate diaboloing with rented office space, desks and swivel chairs) which had a large mirrored room and a small office with trophies and team kit. I’ve never given much thought to my posture, pointing toes or synchronised timing whilst diaboloing and doing so I found pretty difficult. I was shown the classic standing pose, right foot pointed forward, and the synchronised whip acceleration (which they repeat 100 times at the beginning of each practice) along with its variations. They also showed me a fairly simple 1d leg combo which didn’t take to long to learn but I found combining it with all of the posture and group timing very difficult. In fact the combo was one of the coach’s exams for those on probation which usually lasted 1 1/2 years (no instants here) to become full members and if people aren’t up to scratch they are sent away. Another aspect of diaboloing that I was unused to was the formal strict coaching. I was trying to change the shape of my shuffle to right hand dominant and after each and every attempt Luke would immediately say ‘your not using your wrist’ or ‘it needs to go all the way from right to left'. I’m used to somebody showing me how to do a trick or offering advice then going of to practice it but here it was like having my own personal coach and I actually found the constant assessment of what I was doing wrong really helpful. I will finish with a note on style and creativity which people might like to discuss further. I think that an argument could be made that the somewhat uniform ‘asian’ style, formal coaching towards synchronised team routines with standard poses and tricks might limit individual creativity. What I found however was that the focus on performance with an emphasis on posture and movement produced some truly beautiful and stylish juggling. Furthermore the team culture provided a strong general skill base from where a number of high quality diabolo players were able to develop their own tricks and style much of which was taught too and provided inspiration for the rest of the team and beyond. In addition the members of the teams were also involved in choreographing their team routines which is something I rarely think about and I assume many others don’t either. In all I found my visit very inspiring. It has changed the way I think about diaboloing and I hope it will change the way I diabolo too. Thanks to all of the diabolists I met in Malaysia for their enthusiasm and generosity, especially Luke and Heng Ee, hopefully I can return it to you all one day. Thanks also to Jacky from Singapore, another talented Asian Diabolist and teacher (though for some reason Singapore doesn’t have the same team culture) who showed me the same generosity and kindness that I found in KL. Might I be right that the players there are keeping many of their creations for themselves because they don't find them as valuable as the perfectly executed tricks that they do on performances? Thanks for the epic post. Maybe I'll go there... in 4 years. Very complete and interesting, thanks so much for posting. I am currently really looking into diabolo asian culture too and you just taught me so much with your post! I really enjoyed reading that, and thank you for putting time and effort into sharing such a great experience. But after thinking about those teams I was wondering something: is it their jobs to be performers or for all of them it's more like a hobbie and they do that beside something else ? In any case I'm really respectful in front of so much talent and skills. I've been recently watching lots of Asian solo routine and I've really been amazed by them. Any way I hope I'll be able some day to make the way over there !!! Don't ever apologise for such a great post! Ollie as in occationallyquirkus ollie? well done for getting through all that. yes mark, one and the same. though that seems like quite a while ago now. pascale still hasn't forgotten that you described her as thorny. is it their jobs to be performers or for all of them it's more like a hobbie and they do that beside something else ? They were all full time students (at high school or university) and yes diabolo was a 'hobby' which they all obviously enjoyed on that level. What i tried to get across was that it was much more than that. It’s part of their cultural heritage and the formation of teams and performance focus comes from that. I don't think that any of them were full time performers or that the teams made lots of money out of there public performances and teaching (though they were certainly able to rent an office, buy costumes and kit, pay a coach and travel to competitions) but essentially they love diaboloing and consider the performance/team aspect to be an important part of it. Hope that makes sense. there were a lot of players and a lot of very good tricks so i don't think there is room to put them into a performance. Plus i'm not sure lots of hard technical tricks work well in their public public performances (though an impressive run of 3d feeds did make 2 little girls in the audience jump up and down with excitement ) what i found incredible was that their performance posture and style came across even when they were experimenting with new tricks. They also all seem to freely share and teach each other tricks and had picked up a few from Tiawanese teams. I've got some video clips that i have amaturishly put together. As soon as i work out how to upload it and find some on some suitible chinese pop i'll post it here. Thanks for that Ollie - very interesting and inspiring. Really looking forward to the video, I find myself indulging in some mild performance stances and posture when I perform these days; I think an audience likes to see that you trying to present your tricks to them in a visually appealing way. Do they all use standard V2's? Have they heard of crackers and Guillaume? Anyway if your ever round Dorset way pop in. They were certainly up to date on a lot of western videos and knew of several big diabolists (Sharpes etc). Purple Clock had recently been released when I saw them and they were all pretty amazed by it. They also found a video of Joona/Eljas and asked me to explain what was going on but I had no idea. Pascale and I are moving down to Salisbury at the beginning of next year so I might pop round. Are you still living in the middle of the woods? Here is a video to accompany the write up of my visit to meet malaysian diabolo teams in KL. Sorry for the poor quality video and editing, it doesn’t reflect the skill and quality of those featured. As you may guess I didn’t intend to make a video so it’s really just a compilation of a few of the clips that I managed to get when I wasn’t dumbstruck by all of the stuff going on. In hindsight I wish I had got more shots of the general skill level of more players but Diabolotino tends to steal the show. Anyway hopefully you will get a feel for the scene out there. Ollie, you disappear for what seems forever and come back with an almighty entrance. That made for a quality read over tea so thanks for the insight. You and thorny are welcome back to bristol any time. some amazing new 3d tricks in there. and the continuous vertax gens were so good! I love it, thanks for sharing Ollie . Can't wait to go see this live! That is some of the best diaboloing i have ever seen! And thanks for the post, very interesting reading!